Many mushroom hunters are familiar with Hygrophorus russula--a Hygrophorus species that looks a lot like a Russula. 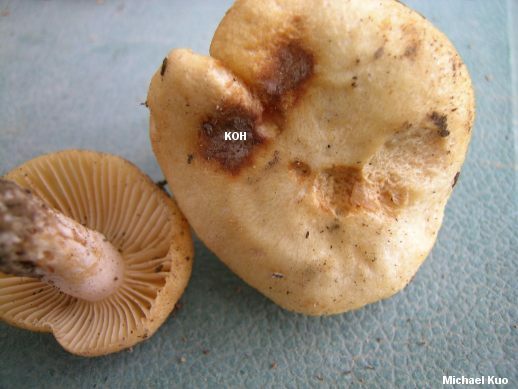 Russula earlei might be fairly characterized as the opposite: a Russula that looks like a Hygrophorus. 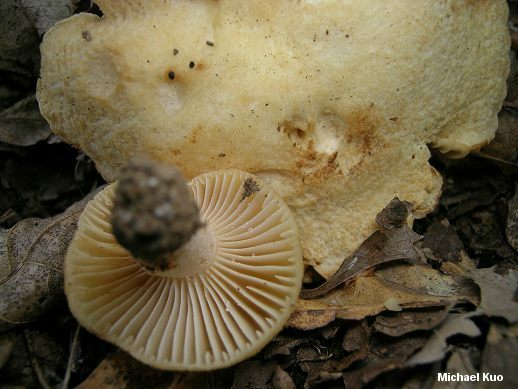 Its waxy-textured cap, along with its thick and distantly spaced gills, are not typical for the genus--but once you have determined it's a russula, Russula earlei is easily identified, since nothing else (in North America) comes close. Ecology: Mycorrhizal with oaks, beech, and perhaps with other hardwoods; growing alone, scattered, or gregariously; summer and fall; apparently widely distributed east of the Great Plains. Cap: 3-11 cm; convex when young, becoming broadly convex to flat, sometimes with a shallow depression; a little sticky when wet; finely rugged, with a waxy-granular feel; the surface often cracking up with age; straw yellow to dirty orangish yellow; the margin not lined, or faintly lined at maturity; the skin tightly adnate, not peeling easily. 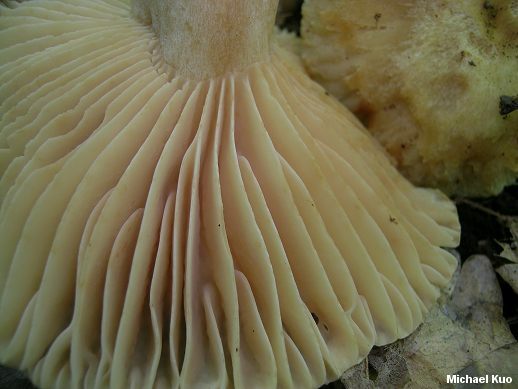 Gills: Attached to the stem or beginning to run down it; distant; whitish to creamy, becoming dull yellow; often with a water-soaked appearance; sometimes spotting and discoloring reddish brown. 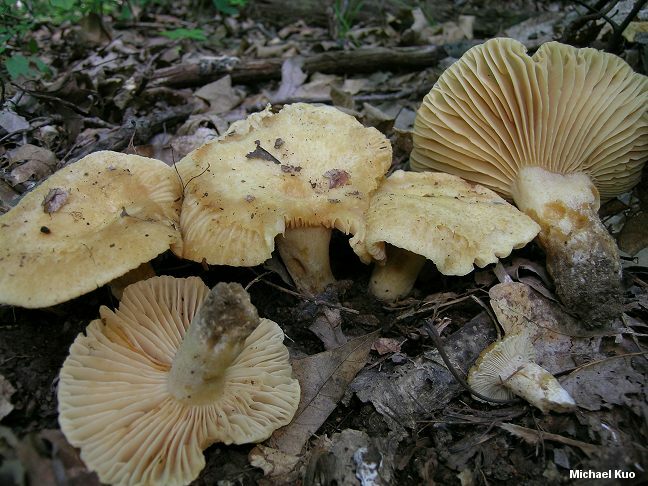 Stem: 2.5-7 cm long; .5-2.5 cm thick; whitish to dull yellow; dry, but with a waxy feel and a water-soaked appearance; sometimes discoloring reddish brown near the base; fairly smooth; basal mycelium white. Odor and Taste: Odor not distinctive; taste mild, or slightly bitter or acrid. Chemical Reactions: KOH on cap surface dull red to reddish brown; iron salts on stem surface negative to pinkish. 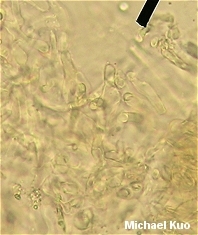 Microscopic Features: Spores 3.5-6.5 x 5.5-7 µ; warts mostly isolated, extending to about .5 µ high; connectors scattered, not usually creating reticulated areas. Subhymenium prosenchymatous. Pileipellis a partially gelatinized cutis of mostly repent elements, hyaline to brownish in KOH, with cylindric-irregular terminal cells that feature rounded to squarish apices; pileocystidia absent. REFERENCES: Peck, 1902. (Saccardo, 1905; Burlingham, 1915; Beardslee, 1918; Bills & Miller, 1984; Kibby & Fatto, 1990; Shaffer, 1990; Phillips, 1991/2005; Roody, 2003; Binion et al., 2008.) Herb. Kuo 07290702, 08020802.